Revealing China’s attempt to choke the supply of the drug trade as it progresses along the wheels of urbanisation, having just crossed the halfway mark. 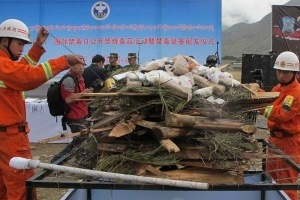 Police have raided 141 drug-manufacturing dens, seized 1,432 tons of drug-making ingredients and shut down nearly 350 entertainment venues for being affiliated to the illegal drug trade, said the ministry. Indeed, there are lessons for China to be learnt by looking at the US attempt. P.s. I suppose the subtext of choosing a photo of Lhasa instead of one of Yunnan which was too obvious not to remark on… Lhasa is not mentioned once in the article. Drug prices in illegal markets have increased by an average of 35 percent due to an anti-drugs campaign initiated by police, the Ministry of Public Security said on Tuesday. The nationwide campaign that was initiated three months ago to crack down on the illegal drug trade has caused a shortage in supply in black markets, the ministry said in a news release. The cost of drugs, including heroin, has soared by an average of 35 percent, and the price of methamphetamines, better known as “ice”, has increased by 40 percent. “Suspects have said it has become very difficult to buy drugs,” the news release said. Police have arrested nearly 57,000 suspects in around 50,000 cases on illegal drug-related charges, according to the ministry. Please click here to read the entire article at China Daily.